Breast Cancer Awareness Month Jewelry Giveaway! Excluding skin cancer, breast cancer is the most frequently diagnosed cancer in women. With that in mind, women should be proactive about their breast health by regularly doing self-exams and women over 40 should get a mammogram annually. 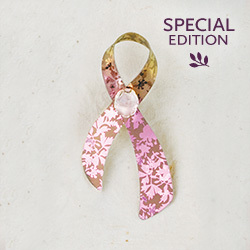 Holly Yashi Breast Cancer Special Edition Pin, $48. During Breast Cancer Awareness Month, it's a great time to support organizations and brands that help to provide resources and research for breast cancer prevention. That's why Everything She Wants has partnered with Holly Yashi, an online, handcrafted jewelry store co-created by breast cancer survivor Holly Hosterman. A portion of the proceeds from Holly Yashi's Special Edition collection will be donated to the Dr. Susan Love Research Foundation, and we encourage our readers to show their support and pick up a lovely pair of earrings ($28), necklace ($38) or pin ($48). 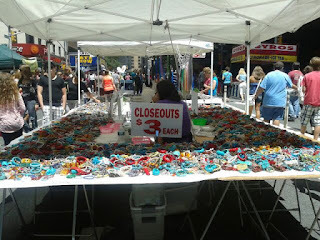 And one lucky reader -- selected at random -- will win a piece of jewelry from the Special Collection. 2) Follow us on Twitter @TracyEHopkins. 2) Leave a comment with your first name and tell us how why breast cancer awareness is important to you? This giveaway offer ends Thursday, October 4th at 11:59 p.m.
One of my good friends was just diagnosed with breast cancer at age 34. She's tough and has a great support network of friends and family and is already on the road to recovery after a double mastectomy. I want to support Breast Cancer awareness to let people know how important screenings are for early detection.